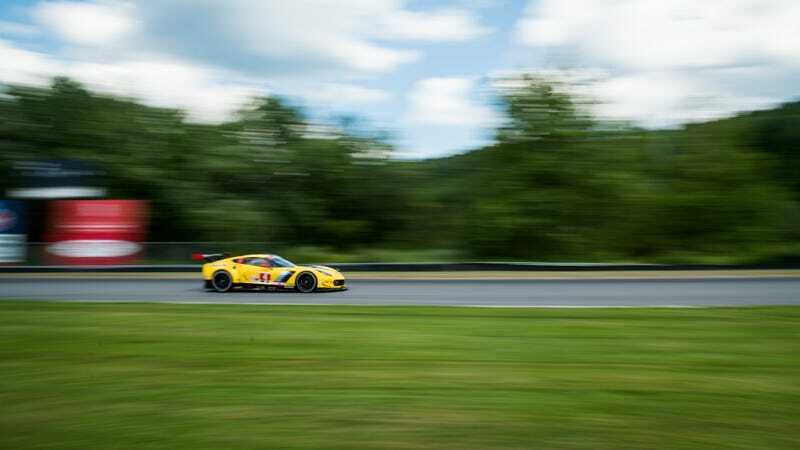 Last weekend’s combination of IMSA GT Le Mans, Prototype Challenge, GT Daytona and a gorgeous summer Saturday at Lime Rock Park equaled one of the best racing weekends the Northeast had to offer. I was there snapping photos—one of the best views there is—and here’s what I saw. I should first mention that I truly love Lime Rock Park. Because of its lack of any permanent grandstands, it feels like hanging out in someone’s backyard rather than a place that can claim someone’s life. As pit lane cleared, you could sense the mood change. It was time to race. I got chills as the Ford GT went by. There’s something about seeing it race again at Lime Rock that tugs on the emotions that make up any car guy or girl. On this particular Saturday, it was hot. Really hot. If you follow Jalopnik on Snapchat, you could see my sweaty self wearing a Camelback that held three liters of water. I consumed all of it before the end of the race. The track temperature must’ve been in the neighborhood of 120-plus degrees. Some might knock Lime Rock for its size, but that’s what makes it so awesome for a spectator. You can walk around to every corner, pick your favorite, and go back to it for the rest of the day. What I especially love about this series is that it’s based off real cars, and no car looks more “real” than the Viper. Last year during the launch of the ACR, I talked with the Viper engineers who told me how they designed the base Viper with the ACR’s wing in mind—even though the funding and approval for the ACR program wasn’t green lit yet. They always hoped it would (and it did), so seeing this car on track must make those engineers smile. That makes me happy. Because these cars are so damn fast, the “optional uphill” was put to use, bringing the race closer to the spectators. That’s not necessarily a bad thing. Speaking of wonderful things, there’s something special about seeing a Lamborghini race, while they’re even better to hear. The wail from the high-revving V10 under load is distinctly Italian, and even though my hearing likely suffered from taking this photo, it was worth it. At the end of the day, team Corvette earned their 100th win, while their car looked like it had just consumed a meal full of hot, molten rubber. Team Magnus and friend of Jalopnik Andy Lally also took the checkers, as the team pushed the car towards the winner’s circle. I can’t wait for next year’s race. Michael Roselli is Jalopnik's Video Creative Director.